June 11, 2009 ~ Today we got our chicks & ducklings. 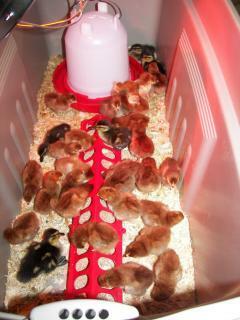 20 Rhode Island Red pullets. 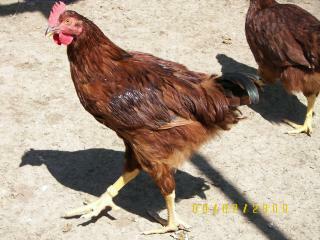 5 Rhode Island Red straight run. 5 Mallards straight run. The whole family adores them. Praying that they all make it. Tonight we have them in the heated garage in a 50 gallon Rubbermaid container all together to keep warm and they seem to be doing well. If this seems too small we'll separate them tomorrow. The ducklings are a little overly excited in w/ the chicks so they may have to be moved. June 12, 2009 ~ They made it through the night. We were really worried about them. They all seem very healthy though so hopefully they'll all make it. 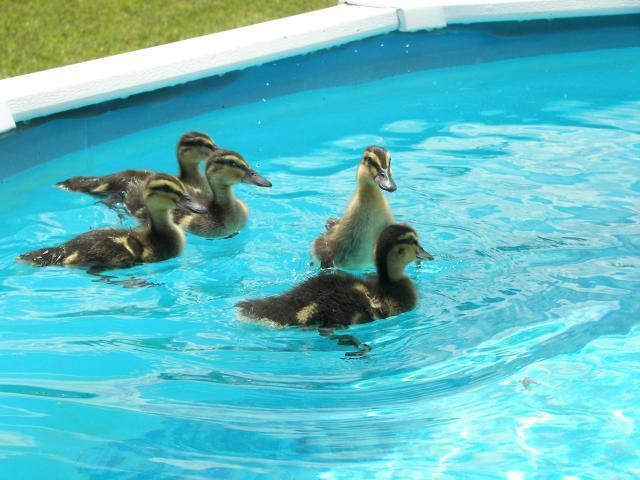 Put warm water in one of the 50 gallon totes & the 5 ducks loved swimming. The littlest has been named Diver, as it was the only one brave enough to go under. They all cleaned themselves well and were then placed back with the chicks in the brooder. 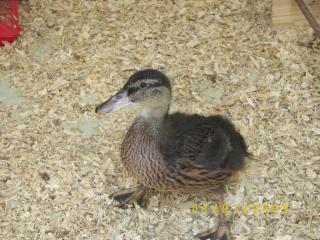 Another duckling has been named Bamm-Bamm because he pecks at everything and another Pebbles. My 15 y.o. daughter loves The Flintstones, haha! June 15, 2009 ~ Guess what. We've never counted them till yesterday. Just assumed because we ordered 25 chicks that that's what we got. Surprise! There are 26! And after 4 days we still have them all so I'm very happy. They are getting big so FAST!! Wing feathers are wonderful and now the tail feathers are really sproutin'. Have a couple hens (we think) that are really getting big. Maybe they'll be our good layers. Getting ready to work on the coop. Can't wait. June 19, 2009 ~ Today is Hunter's 9th birthday - Happy Birthday Dude! June 21, 2009 ~ They are getting so big!!! The Mallards are double the size they were and one is huge. We think we may have 1 Drake & 4 Hens - but who knows? Even they are starting to let us hold them. Not for long but it's better than it was. 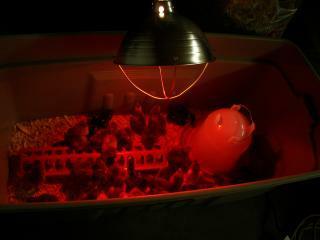 The chicks are "flying" from the feeder to the roost to the top of the waterer. They are all so funny! Our guess is 3 Roosters & 23 Hens. It will be exciting to see if we are right. Still planning the coop. Can't decide exactly what we want. Just love the little guys. Let the ducks fo for a swim in the pool today and they had a ball. Just left them in there a few minutes and then put them right back in the brooder to rest & warm up. They did love it though. Diver was the first one under of course. July 8, 2009 ~ Boy does time fly! They are 4 weeks old today and we haven't lost any! Hunter remarks on this everyday. The run has been started and we decided on the Playhouse my kids used as a coop. Then later I am going to add on so that I can divide the chickens & ducks up so there will be more room and I can put a pond in the duck's run. We are also using the kennel panels from our two outside dogs that passed away during the last couple of years. By doing this we are saving so much because we don't have to buy posts or a coop. They want out of that coop in the worst way. We have had 2 escapees that had to be removed from under the coop and one flew to the window to look out. You could just see the want in his eyes to get out! July 15, 2009 ~ 5 weeks old. Still have them all. Only problem we have right now is that one of the ducks is limping. Tonight Taylor & I put a dog cage in the coop for him because the other chicks/ducks were walking all over his foot and I thought he needed to be alone so it has a chance to heal. I hope he's alright. He's eating well and cleaning himself, so he seems healthy - he just limps. We have their coop and run almost finished. I'll be posting pix very soon. August 15, 2009 ~ Oh my it has been so long since I updated. First of all, - Happy 16th Birthday to my dear daughter Taylor!!!! Now, onto the chickens & ducks. They have all gotten so BIG! It's so hard to believe! We love them and their personalities. Hunter's hen Rose is the funniest. She LOVES people. When you go in she flies to your shoulder to sit or onto your back if you are bent over working. We numbered them all so that we can keep an eye on who is doing what but with her you definitely do not need the ID. He can carry her outside the coop and she just nestles in for the ride. We still need gravel for the lower end of the run where we are putting a little pre fab pond for the ducks. It gets very muddy on that end due to all of the rain we've had so we're going to do the gravel to try to keep it cleaner. The mud stinks! The upper end of the run is okay due to it draining down. The other thing we have already done is take all of the pine chip bedding out and and replaced it with construction sand. That was the best thing we could have done. It is so much more economical. It's like a huge kitty litter box. I just use the litter scoop to clean it up into a little bucket and throw it onto the end of the garden where we already harvested the beans. No where near the amount of waste with the pine chips. It smells betters too. I definitely recommend it to everyone. The only down fall is the sand sticking to your shoes but we started wearing barn boots out and just leave them outside the back door. Feet don't get sandy and nothing is tracked inside. The ducks I thought were going to do the Duck Rodeo forever but after about 2 weeks we have them to where Hunter shines a light on the end of the ramp & I say "Up the Ramp" over and over and they line up and all 5 head in. They won't do it without us but it only takes maybe 2 minutes to get them in now so I'm okay with it. Sorry I haven't gotten any pix here yet. Hope to soon. September 1, 2009 ~ Pete crowed. It's in a boy whose voice hasn't changed yet version but it was definitely a crow. Alan heard him first and called me at work to tell me. I text our daughter at school (he's her Rooster) and when Hunter came home from school Alan told him. Can you tell we're proud? September 9, 2009 ~ Still going at it. He sounds better every day. Hunter & I cleaned the coop tonight & I was thinking about what it's going to be like when it's cold and snowy out. Oh that's going to be awful! Figured out the 26 chickens and 5 ducks eat 100 lbs of feed a month. They don't get outside the run too much because we have a dog and aren't sure what would happen. Also the neighbor has a bird dog that runs loose so we let about 10 out at a time in the yard while we're cleaning the coop and playing with them. Pete & Zeus keep the hens pretty close. October 23, 2009 ~ Wow! I haven't updated in quite some time! Pete crows - all day long. He's quite good at it now. Doesn't wake anyone up too early. Zeus on the other hand never crows. I find that odd but who knows? I love listening to Pete crow, the chickens clucking and the ducks quacking. They are hilarious and are music to my ears. Even my neighbor commented to me yesterday that she can hear Pete and thinks it's a hoot. No eggs yet but they're still a little young. We just switched them over to laying crumbles, so... They have investigated the nesting box but are being good girls and staying out of it at night. Having trouble with water in the coop. Rain coming in the pop door and making the sand muddy. Alan's trying to think of a solution to this. 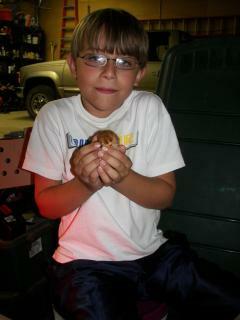 Hunter is still my little chicken farmer. He is so good with his chores and NEVER complains. When we went camping he even stood by the phone saying make sure the chickens are shut in, do they have food? did you lock the door? as we were talking to his sister who was taking care of them. So, I'll try to update a little sooner next time - probably at least when we get our first egg.